The first hour and 20 minutes of Non-Stop are taut, relatively stylish, and believable enough – given the film’s rather outlandish, implausible premise. Director Jaume Collet-Serra, working from a screenplay by a trio of writers, sets up an intrigue – if far-fetched – premise. 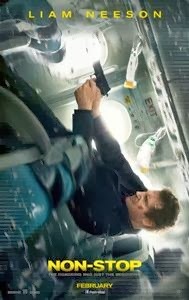 Air marshal Bill Marks (Liam Neeson) boards a trans-Atlantic flight and starts receiving text messages from someone apparently on board the plane. The supposedly secure network has been breached by someone demanding $150 million dollars. If this mysterious passenger doesn’t get paid, people start dying. That’s all you really need to know going in. The trailer already reveals too much about the plot, but plenty of twists remain. Julianne Moore plays Jen Summers, a window seat-loving passenger who serves as an impromptu assistant to Marks. She’s also a suspect. Jack Hammond (Anson Mount) is another air marshal on the flight. Hammond knows the truth about Marks’ troubled past, a mix of family tragedy and substance abuse issues. Marks himself can’t figure out if he’s just being overly paranoid to suspect his colleague’s involvement. There’s also a variety of passengers, all of whom could possibly have a hand in the money scam – including a cell phone programmer (Nate Parker), a Muslim doctor (Omar Metwally), and an NYPD officer (Corey Stall). Not even the flight crew is above suspicion. Ever see a movie in which the ending is so preposterous that it nullifies everything that went before? For most of the running time, Collet-Serra keeps the audience guessing. 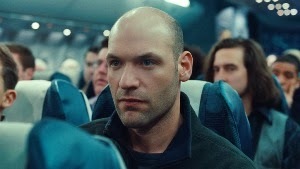 An airliner, cruising above the Atlantic Ocean with nowhere to land, makes a neatly claustrophobic setting for a thriller. Onscreen graphics display frantic text message exchanges with surprising effectiveness. 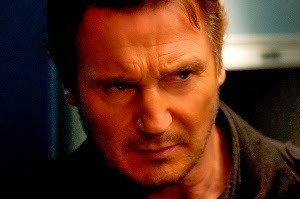 Neeson has played variations on this role before, in the Taken movies as well as his previous collaboration with Collet-Serra, Unknown. He’s still magnetic to watch though, and the supporting cast is interesting too. But then we start getting answers to Non-Stop’s mysteries and it all evaporates. I’m not going to spoil anything, but the sudden intrusion of a “message” throws the fun of the movie completely off kilter. Incongruously, just as the film takes a thematic turn toward something more serious, any semblance of plausibility flies right out the window. It makes Non-Stop tough to recommend. If you can’t get enough of Neeson in the ‘tough guy’ mode he has favored in recent years, definitely check it out. But consider yourself warned that, in the end, Non-Stop crash lands.